What did you just hear? What made you say " what?!! me??" *Be the Blank Noise Agent. Take the discussion home! ask your mom. sister. grandmom. aunts- what did they get to hear? Was it any different back then? Ask your colleagues, friends, peers...Take it to the streets, ask random strangers, make conversations, and EMAIL US. 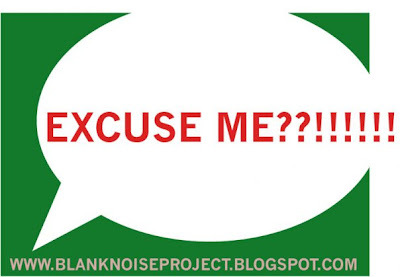 email us at blurtblanknoise@gmail.com, subject titled, "excuse me?" Your email responses will be listed on the blog with photographic illustrations of the responses. Email us no later than Aug 14th. 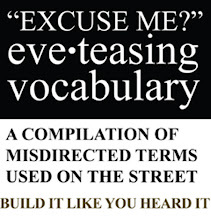 Let's build the 'eve teasing' vocab! On the 17th of August we will put all the words out on the blog! ( date has been shifted from Aug 15th to 17th). Apologies. 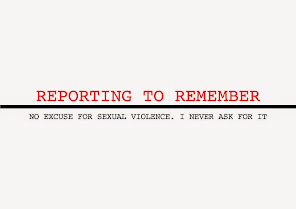 Linked from Hollaback! The film maker Hadleigh-West walks around New York, San Francisco, Chicago and New Orleans with her video camera. 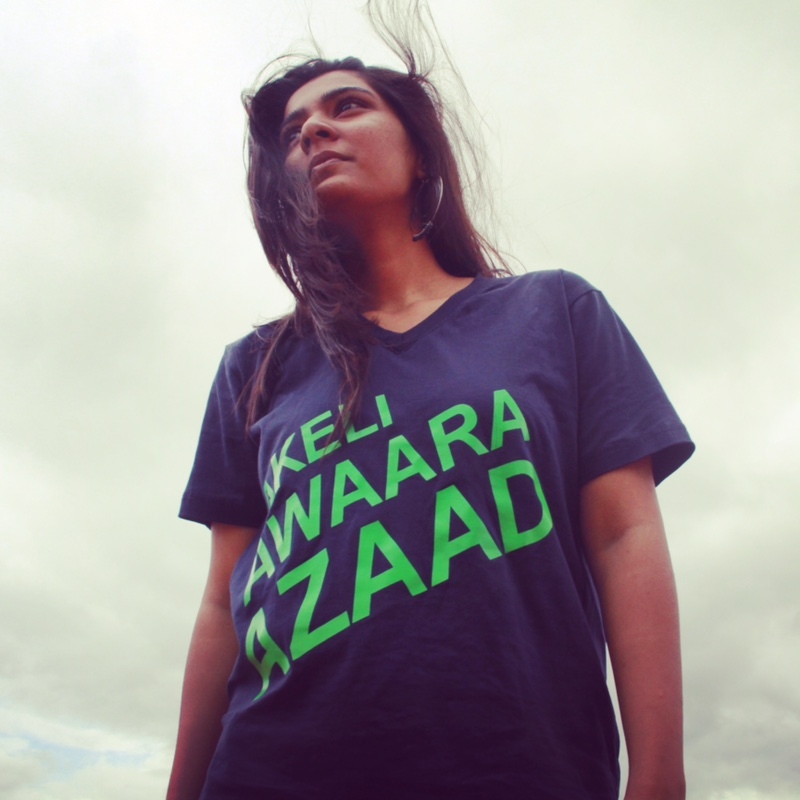 Nupur Mathur participated in Blank Noise in 2003, when the project had just started. She along with eight other students of Srishti School of Art Design and Technology were participants of workshops I facilitated over 3 months. At that time I was graduating and Nupur was in her first year. Silence is my first fiction film. The script for Silence was developed from an incident that happened to me a few years back. I was returning home from a tiring day at college. Frustrated, I just wanted to get home, on the way however, a little beggar child kept tugging at my clothes and interrupting my walk home. Eventually I turned around and harshly brushed her away saying leave me alone, I’m not going to give you anything. It turned out that the little girl wanted no money, rather wanted to give me a flower. I’m not sure why she wanted to give me this small white flower she had in her hand, but I was so overwhelmed by my stupidity and arrogance that I walked away rather than embracing the humble gesture. After this incident I started to think about feminism and growing up. Of how the gaze of a man shifts as you grow up. The little girl I once was, was carefree, a tom boy who would hang out with the boys, ride cycles, cut my hair short, talk to strangers etc. I still however, looked at my older cousin sisters and wanted to wear sari’s and dress up and look beautiful. The day did come when it started to change. Puberty kicked in and I changed and continue to do so. The original idea of Silence, which probably would have been called something else, was to explore these lost freedoms because of growing up, because of the way the world is. The little girl was me as a child and the older girl is me now. The little girl however, aspires to be one day, what the young woman is. The young woman however is subjected to the world outside, the male gaze and attention she’d rather not have, at least in the situation I put the young woman in. I chose to not have the protagonist react to the incident in the bus because I think that mostly that is what happens. When faced with harassment in a public space, especially if you are alien to the people around you and different from them, you end up feeling helpless. It is a feeling where one does not know what to say or do. It is only through an afterthought; after the shock gives way to rage that one finds strength. I feel like men have a certain power over women in our society, this ‘silent arrangement,’ that has come into being is what women have to question. One of my closest friends has a problem with Blank Noise. It's a very specific problem and every time we enter into the argument, we follow the same familiar patterns: I feel obliged to adopt a feminist perspective of outrage at what he's saying and he assumes an alpha male aggressive position that is cleverly bound into a rights argument. “How can you stop me looking,” he'll ask, in mock outrage. Not a moralistic outrage but from a position that sees the act of looking as a sort of basic right. As long as I do not harm you, touch you, attack you... what right have you to stop me just looking? And I will counter him, trying my best to avoid slipping into the nebulous and often weakening terrain of argument that rests on “personal experience”, by keeping this argument within the realm he has defined – one of rights. Are we denying someone a basic right when we say we “object” to being looked at in a way that is unwanted, sexually aggressive, invasive? 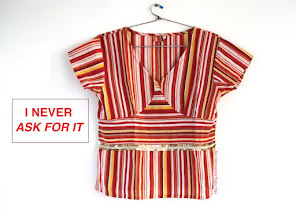 Who decides when someone's look has changed from “Eesh, what terrible clothes” to one that is unsolicited and sexual? In a sense the parameters of this debate seem to have already been defined by Section 509 of the Indian Penal Code that Annie has just written about. It mentions criminal liability for “words, gestures, sounds and exhibition of objects” and through that list has acceded that physical contact is not the only invasion that can be punished. It leaves out looking – why? Because this is too nebulous, too open to conflicting interpretation to be codified by law? Blank Noise has always maintained however that a look which is invasive (you could call it a “leer”, I suppose), persistent in the face of expressed disapproval from its recipient and unwanted is equatable to harassment. “But if a girl is pretty of course I will stare at her,” says Alpha Male. And Alpha Female would agree that she would stare at a hot guy too. But initial interest is invariably tempered by the response to it. In seconds you will know if you are making someone uncomfortable. When you persist with your looking beyond that initial stage, you are being invasive. This is not a naive, innocent act anymore, it is not someone “looking” around at their environment or “glancing” at a pretty girl. It is a knowing incursion into someone's private space that is making them uncomfortable. The breaching of the line where the “right” to look infringes upon the other's right to “be” - stand, walk, wait for a bus without being hassled – is one that the perpetrator of the look is always keenly aware of. We assume this when we talk about "looking". This looking despite knowing it is unsolicited and making someone uncomfortable is what we are addressing. Take a crowded narrow road like Bangalore's Brigade Road, for instance. Men drape themselves on the railings, looking at women passing by. Of course they are not always just looking. They reach out as well, to poke, pinch, grab. In the rush and the melee of all the concentrated shopping that unfolds on that street, women often just look downward, avert the male gaze and hurry past. But sometimes, when you're out shopping, you want to just wander down a road. You want to take your time, looking at stores, making eye contact with people walking the same street that you are. You don't want to have to seem like you're apologising for your presence on a public street. And yet when you're met by people “looking” at you (“checking you out”, “leering”, “sussing you”), you shrink into the barest minimal space and hurry on. Blank Noise began holding interventions along the long stretch of road which was so far dominated by men. Power equations defined by the dominant male presence were challenged and then flipped as women from Blank Noise occupied the railings along the road, looking back at men who looked at them. Men were eased off the railings as women took over them. Often on these interventions there would be as many as 40 women along the railings on that road: a space which was usually occupied by women hurrying down it, looking downward now had women lounging around, enjoying what is, essentially, a public space for everyone to lounge around in. So when men suggest that looks are easily misunderstood, I wonder if this is something that only men could believe. Blank Noise isn't talking about meeting someone's eye when you walk along a street. 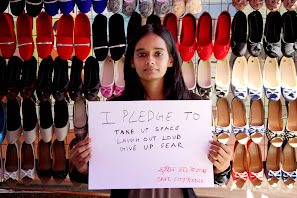 We're not talking about thinking “oh, that girl's cute!” at a bus stand and then walking on. We're talking about persistent, annoying, invasive looking which is completely unmindful of the response of the person you're subjecting to your insensitivity and “desire”. Like that man on the train who reached out repeatedly to make my journey hell and then, pleading forgiveness, told me “he could not help it”. "Looking" is not always a neutral, innocent act.